Rizk - Read this review before registering! Rizk a relatively young and casino that was founded in 2016. It is operated by the Gaming Innovation Group that also owns the online casino Guts. Despite the young age of the casino, it has already made a name for itself as a trustworthy and reliable casino with a fantastic game selection. Rizk offers the games from different software developers, among them Netent, Nyx Gaming, Microgaming, Play'n GO, Betsoft and Quickspin. The website is available in English, German, Norwegian, Finnish and Swedish, which also shows that the main target markets are in Scandinavia, English-speaking countries and Germany. The casino is also available as a mobile version, and you can play many games on the go, and many smartphones and tablet computer are supported. The game selection of at Rizk includes over 450 games from different developers, such as Netent, Play'n GO, Nyx Gaming (Amaya, ELK, Thunderkick, NextGen Gaming), Evolution Gaming, Microgaming, Quickspin, Scientific Games, IGT, Betsoft, Yggdrasil, Red Tiger, Genii and Edict. The games are regularly updated and you can also play them directly in the browser without having to download a casino software. A big chunk of these games can also be played on mobile devices, such as iOS or Android smartphones and tablet computers. The games on the website can be sorted into different categories, by provider, or alphabetically. You can find a very large and diverse selection of slot machines that include some of the most popular games from the best providers. The website also offers access to the Evolution and Netent live casino where you can play roulette, blackjack, Caribbean Stud Poker, Ultimate Texas Hold'em or Three Card Poker in an authentic gaming environment against real dealers. Rizk Casino also offers you the chance to win fantastic progressive jackpots, such as the popular Mega Moolah or Mega Fortune progressive network jackpots that give you the chance to become a millionaire from one moment to another. The welcome bonus package that you can receive depends on the country you are signing up from. Players from the United Kingdom can receive a welcome bonus of 200% up to £100 and 50 free spins for the first deposit into the player account. This means that if you deposit £50 you can play with £150! The free spins are credited to your player account in batches of 10 spins for the next 5 days. You also get a free spin at the Wheel of Rizk and you can win free spins or cash. Winnings from the free spins and Wheel of Rizk are wager free. The wagering conditions for the 200% welcome bonus are 45x the bonus amount. After you have fulfilled the wagering you can cash out any remaining winnings. also, keep in mind that not all games contribute equally to the wagering. Most slots contribute 100%, but there are some exceptions. Classic slots and some video slots only contribute 75%, Roulette and live dealer Roulette 50% and other table and live casino games 10%. Please read the terms and conditions for the welcome bonus offer to avoid misunderstandings. The welcome bonus is not the only bonus you can get at Rizk. The casino has many promotions that regularly change, and you can also participate in the Rizk Race tournaments and win great prizes. You can find the ongoing promotions in the Rizk Insider section on the website. When you play at Rizk you will see a progress bar. As you play, this will fill, and each time you fill the bar you progress to the next level. You will then get a reward in form of a spin at the wheel of Rizk which can include cash, free spins, a jackpot, turbo boosters, race points or other rewards. Every 10th level, and after the 5th, you will also get a spin at the Super Wheel where the prizes are even better. This Wheel of Rizk is a fantastic loyalty program that also adds some excitement to getting the rewards. Since Rizk is also operated by the Gaming Innovation Group, you can enjoy all the benefits of this established operator. The quality and service they provide is outstanding, and they do their best to offer players a unique experience in a great gaming environment. The casino has a licence from the Malta Gaming Authority, as well as from the UK Gambling Commission. Both licenses have strict regulations for player fund protection and the casino is regularly audited. Security is also ensured at the casino, and transactions are only carried out through secured SSL connections. Although the casino does not accept many payment methods, the most common ones are supported. You can use credit cards, e-wallets, vouchers, bank transfer or phone payments. However, when using a credit card or Paysafecard voucher, a small fee of 2.5% for credit cards and 5% for the voucher will be applied when depositing. Other methods are free to use. Most withdrawal methods are also not free, and each withdrawal is subject to a fee of €2.50. Trustly Internet Banking is free of charge. The minimum deposit amount is €10 and the minimum withdrawal amount is €20. The positive news is that withdrawals are processed within around 2 hours of your request, which is very fast compared to other casinos. For questions and problems you can contact the casino customer support every day, around the clock through a live chat on the website or you can send an email. The friendly employees will give you a professional and friendly reply. Rizk Online Casino is operated by an established operator that enjoys a fantastic reputation among players. Overall, what the casino offers is great, from the games to the bonuses. 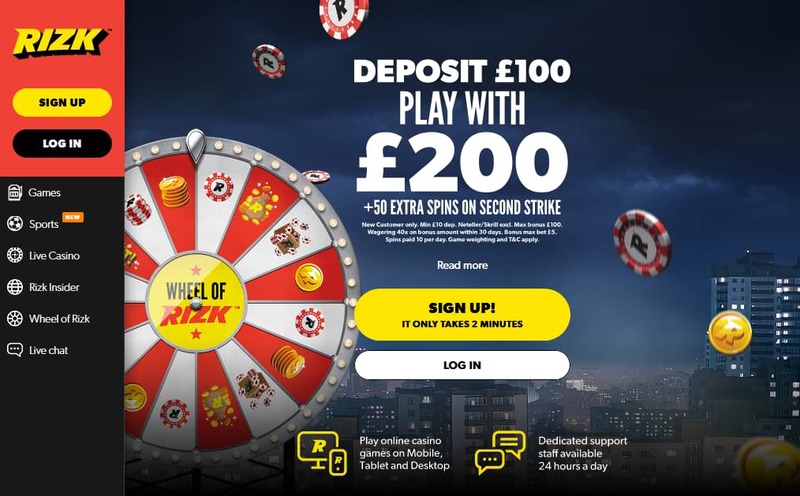 Especially the interesting Wheel of Rizk is a nice touch for a loyalty reward program and the many tournaments can make playing there very exciting. The game selection is also very good, and although not as large as other, the casino offers games from some great names, as well as smaller developers that you cannot find everywhere. The payment speed is also fantastic, as payments are processed super fast within 2 hours, but a small drawback is that withdrawals cost €2.50. This is definitely a recommended casino that is worth checking out!